NICE AND EASY: When would you use an old remote with your Genie? You remember this remote. Back in the 2000s it actually won awards for design and usability. This was back in the day when universal remotes weren’t a dime a dozen at the local drugstore, when the average home theater had five or six different black or silver boxes. A universal remote was a big deal then. In 2013, DIRECTV made the first real change to its remote in about a decade, with the release of the Genie Remote. You know, this one. The Genie Remote is great. It’s easier to hold, it has all the important functions without having rows of confusing buttons, and best of all it brings RF functionality that lets you aim through walls and doors without the high cost you are used to paying for that functionality. It’s a winner. Still, there are a few times you’re going to want to keep the older remote around. The Genie Remote is missing a button or two that just make sense, and while you might not use them all the time, sometimes they’re important. The Genie Remote doesn’t have a stop button. You might not have noticed that, but now you’re looking at the picture and you’re wondering why you didn’t notice it before. It has the left arrow, which “kinda” does the same thing. If you’re in a recording, pressing the left arrow will take you back to the menu you were in. For example it will take you back to the playlist. This won’t stop playback unless you start something else, though. There’s also the EXIT button which generally will take you back to live TV. But there are occasionally times that doesn’t quite do it either. That’s why it’s sometimes nice to have a real STOP button in front of you. Yes, the Genie remote has a Play button. Actually it has one button for Play and Pause. That’s ok… most of the time. But there’s one scenario where that doesn’t work. There’s a long-standing feature of DIRECTV DVRs where you can press PLAY and it will pop up the progress bar at the bottom for just a few seconds. This is a great way to find out where you are in a recording and how soon the show will be over. When you do it with the Play button on an old remote, it doesn’t stop the playback. When you do it with the Genie Remote, it does … and that’s kind of a drag. It’s not often that you have to change the screen format anymore, but when you do, you do. Sometimes you want an SD channel to fill the screen, or sometimes your Genie Client wakes up with the wrong resolution and everything is all grainy. The Format button quickly changes from mode to mode. You can press Info, then arrow over and down to Change Screen Resolution and Format, but that’s a lot of extra buttons. 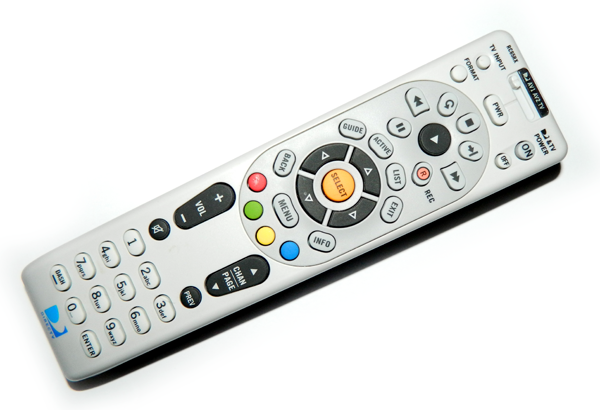 If you don’t have one of the old DIRECTV remotes around, pick up a spare from Solid Signal. They are a good value and they come preprogrammed to work with Genie clients in IR mode, meaning that they don’t have to be paired to the device and the existing Genie Remote won’t stop working. It’s worth it! FROM THE FORUMS: Can you use a Genie Client but limit access to the playlist?